I am so excited to officially announce our partnership for the year 2014 with Red Envelope. Red Envelope will be Skimbaco Lifestyle’s main sponsor for 2014. This partnership means that I will be guest blogging at the Red Envelope blog, co-hosting events, and much more. One of the exciting things for you is that you will get 20% off of some of the products when you shop via my special landing page at Red Envelope. The discount is only for limited time, and applies to limited products. 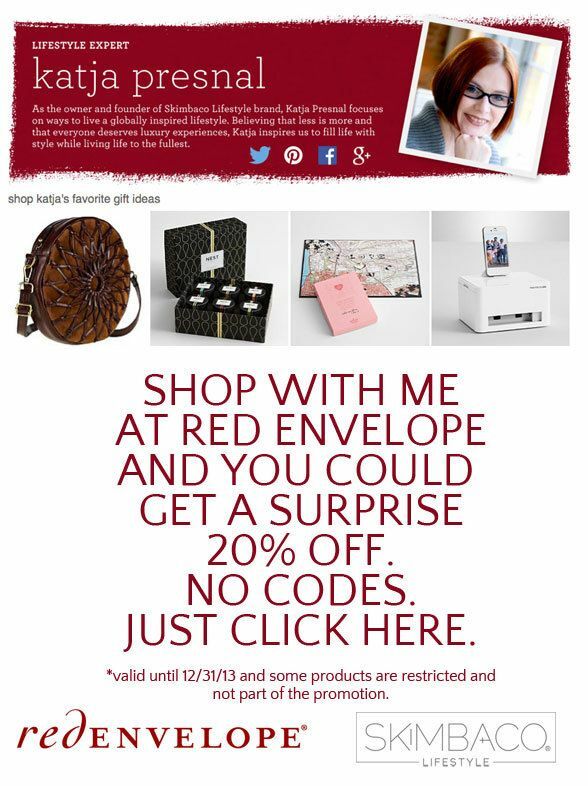 Think of it like a game… you shop at Red Envelope through my link, and you might get a surprise discount. In addition I will be able to give away other discount codes, products and gift cards to our readers throughout the Holiday shopping season and the following year. Please like Skimbaco’s Facebook page and follow me on Twitter @skimbaco and Pinterest to stay tuned for additional promotions. Please share what you purchased with me, I would love to know if you which products you were able to get 20% off! I would like to invite you to shop at Red Envelope with me, but before anything else, I would love to take the opportunity to say why I think we couldn’t have found a better sponsor for 2014. I have always liked Red Envelope, but when I met some of the RE team members and heard the stories how each and every product is picked from around the world, and how much care there goes to picking unique gifts, I was mesmerized. I realized how much we have in common – our Skimbaco team travels (and moves) around the world looking for inspiration and ways to live life to the fullest, and the Red Envelope team travels around the world looking for the most unique gift items. When comparing notes, we had been in many same places! And how many times I had been in my travels and not being able to bring some products home with me, and wished I could have. Now Red Envelope has many similar type of products in their store. I truly believe that there is gift giving, and then there is Red Envelope. I guess in ideal world we would shop at small local stores and bring all of the things we see on our travels home for our friends and family. 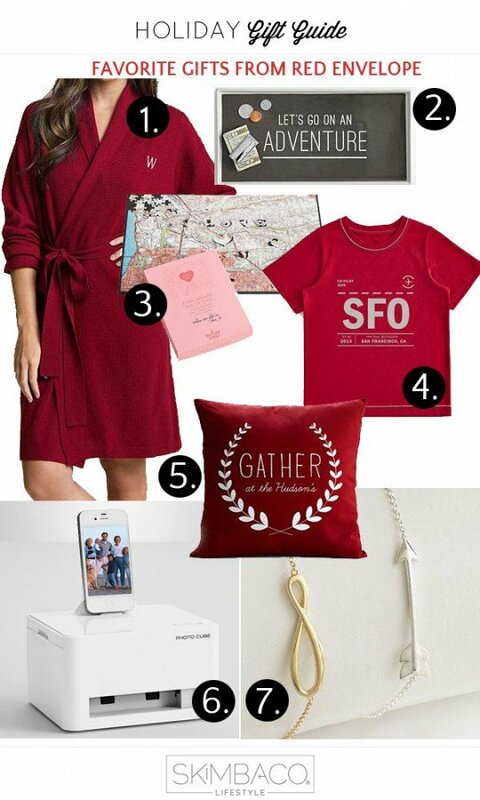 In reality, we are lucky to have online stores that give us the same feel and the same unique products, but makes it convenient to shop at home and have the gifts shipped in gorgeous red gift boxes, ready to be gifted. Here is a very small selection of my favorite gifts at Red Envelope. 1. Their cashmere clothes are on my top wish list this year, this glamorous robe is perfect for your holiday hideaway and for enjoying time at home. 2. The “Let’s Go on an Adventure” valet is A MUST for any Skimbacoer! Get the constant reminder to adventure! 3. The “where we met” puzzle is perfect Holiday gift for your sweetheart, it will be customized with the place where you met! Stock up with chocolate and warm drinks and spend the Holidays at home snuggling and making this puzzle together and reliving the moments when you fell in love. 4. The must have tee for traveling kids! Customized with the closest airport code! 5. “Gather” pillows are customized with family name – great gift for anyone. 6. Print those Instagram photos – this photo cube printer prints directly from your phone. 7. Just a little something for any girl in your life, from teens to moms, these delicate bracelets are not just a fashion statement, but a reminder of living life to the fullest. 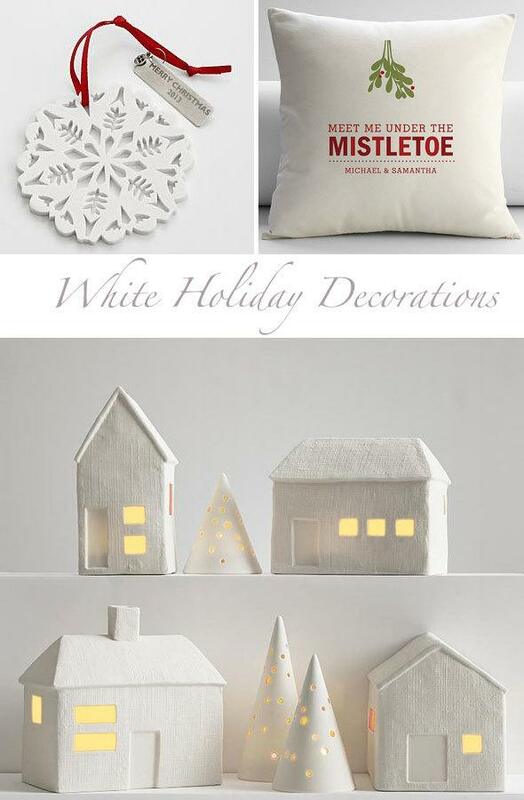 Below are also some of my favorite Holiday decorating items in winter white.